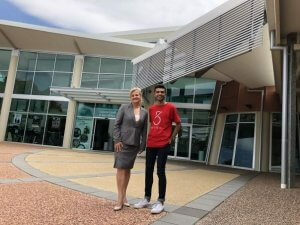 Redland City Mayor Karen Williams with Fifty Six Creations founder and YES organiser Taj Pabari. Redlands Coast will be under an international spotlight when some of the world’s most influential minds gather at Redland Performing Arts Centre on 13 September for the 2019 Young Entrepreneur Summit (YES). Specially designed for 12- to 25-year-old students aiming to become scientists, innovators, engineers, technologists and entrepreneurs, the event will bring local and other young people face-to-face with world leading innovators, educators and entrepreneurs. Mayor Karen Williams said Redland City Council was partnering with Logan City Council and 56 Creations to stage the event, as part of the State Government’s Advancing Regional Innovation Program (ARIP). “ARIP sees Council engaging with Logan City Council on YES to highlight the game-changing work being done by a group of innovative, regional start-ups and entrepreneurs,” she said. “This event also reflects Council’s strategic priority of ‘A Smart City’ by helping to facilitate innovation on Redlands Coast, further positioning us as a smart, innovative city. “Hosting YES on Redlands Coast especially presents our local youth with a wonderful opportunity, as the event will build on the success of our innovation sector by connecting tomorrow’s entrepreneurs with today’s budding innovators. “Innovation will play a vital role in meeting the challenges of the future and in harnessing opportunities for Redlands Coast. Logan City Council Image and Innovation Committee Chairperson and Councillor Laurie Smith said Logan City Council, a platinum partner of YES, would showcase the rapid pace in which it has embraced the start-up culture. “Logan is the dynamic city of the future and we’ve seen many start-ups and entrepreneurs launch their ideas in our city,” Cr Smith said. “YES will provide a platform for future innovators to network and hone their craft – who knows what concepts it will generate? Fifty-six Creations founder and 2017 Young Australian of the Year Taj Pabari said the organisation was dedicated to encouraging people of all ages to think creatively and innovatively in order to achieve entrepreneurship. “YES will attract more than 500 students from across Australia and New Zealand to Redlands Coast to work with leading entrepreneurs and experienced mentors,” he said. “Attendees of YES will hear just that – ‘yes, it is possible to do some extraordinary things if you have the will and determination’. Mr Pabari said the YES program would feature keynote speakers, panel sessions and interactive workshops. “There will be satellite events held around YES from 13 to 18 September, with events including business-to-business networking, mentorship, investment and scaling seminars for all ages,” he said. For more information about the Young Entrepreneur Summit on Redlands Coast, visit www.youngentrepreneursummit.com.